Janet Echelman’s 1.26 sculpture is a monumental, floating form that pulses with the changing wind and weather and invites you to pause and contemplate a physical manifestation of interconnectedness of opposites – soft with hard, earth with sky, things we control with the forces beyond us. The concept of the artwork stems from scientific data sets of the 2010 Chilean earthquake and tsunami, and the notion that we are all connected between the earth’s natural systems. Studio Echelman generated the 3D form for the sculpture using NASA and NOAA data that measured the effects of the earthquake including tsunami wave heights across the oceanic expanse. The resulting vibrations momentarily sped up the earth’s rotation, shortening the length of the day by 1.26 micro-seconds, which became the catalyst for the 1.26 sculpture. To date, the 1.26 sculpture has been installed in 11 cities on 4 continents. After its 2010 premiere in Denver, Colorado for the Biennial of the Americas, it traveled to: Sydney, Australia (2011), Amsterdam, Netherlands (2013), Singapore (2014), Montreal, Canada (2015, 2016, 2017), Prague, Czech Republic (2015), Durham, UK (2015), Santiago, Chile (2016), Shanghai, China (2017), Chiayi, Taiwan (2018), and Hong Kong, China (2018). In Shanghai, it was on view at 'The Hub' in Shanghai's Hongqiao District. 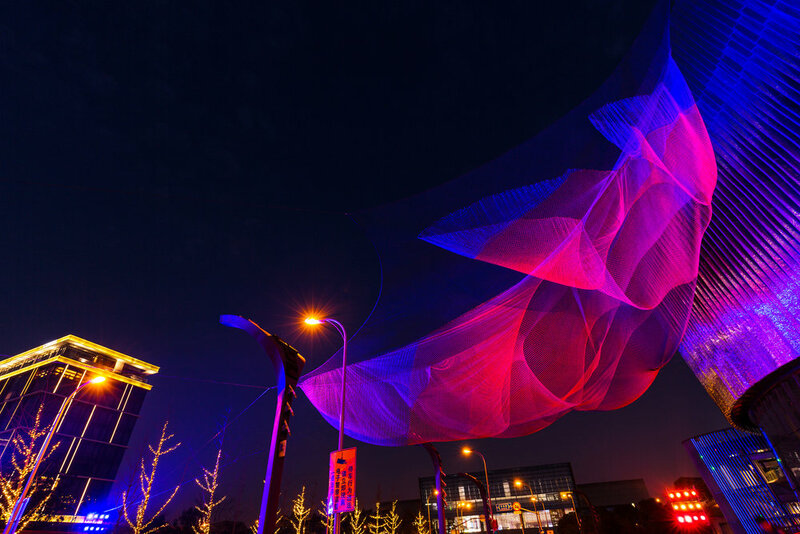 The sculpture is completely soft and constructed from two types of technical fiber, making it lightweight enough to lace directly into existing structures without extra reinforcement. Ultra high molecular weight polyethylene (UHMWPE), a fiber more than 15 times stronger than steel by weight, makes up the structural portion of the artwork. Custom color blends of high-tenacity polyester braided twines make up the remainder of the sculptural net. 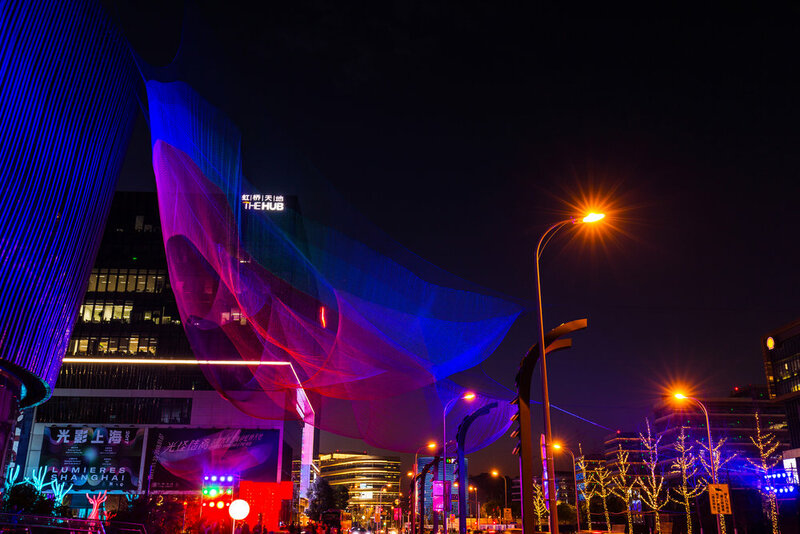 Echelman combines these with programmed colored light to create the final artwork.